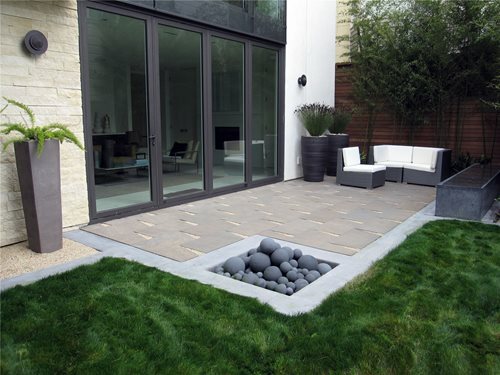 For this complete backyard makeover the client wanted a contemporary look that would match the interior of their home. The yard went from overgrown to immaculate with a new fence, deck, graphite colored concrete paved areas, ledger stone water feature, retaining wall and low-water plantings. This tiered wall fountain is perfect for adding soothing sounds to a small outdoor space. This low, gas-fueled fireplace is scaled appropriately for a small yard. 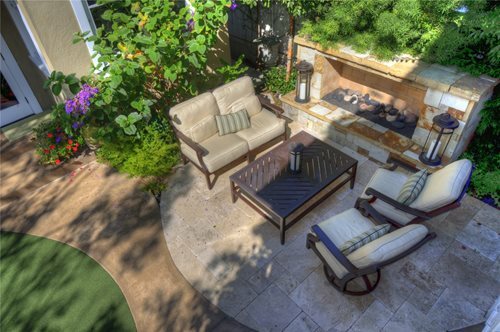 This urban backyard features a permeable patio, a gas fire pit and a concrete fountain. Learn more about this urban garden.